Everyone knows what a philanderer Zeus was, in fact, I'm sure it was something of a family joke on Olympus. But Hera wasn't laughing. She knew her husband cheated on her just about every second of the day, but she wasn't going to just sit there and watch it. No, Hera spent just about every second of HER day trying to curb her hubby's "appetite." You'd think that Hera would take most of her anger out on her husband, but nooooooo. Hera spent all her destructive vengeful energy on the poor female (or in SOME cases male) who happened to be Zeus' current plaything. The object of today's story is to tell about just one of Zeus's little run-ins with Hera, but it begins on earth rather that in the Divine Realm. Io, daughter of Inachus the King of Argolis, was made a priestess to Hera. Zeus, who was into the whole "danger thing" at that point, seduced the girl while she was still in Hera's service. Now, Hera finds out basically EVERY time Zeus cheats on her, did he think she wouldn't notice when it was right under her nose? I don't think so. Zeus was ready, because all the time he was having his way with Io, he was also keeping an eye out for Hera, and when he noticed her aura - zap! he turned Io into a cow. How sweet. (Alternatively, some priestess named Inyx cast a love spell on Zeus and he cast the spell on Io to shield his intentions.) Now, you'll notice that the paintings here illustrate Zeus in cloud form. That very well may be ... but I don't know where that particular version of the story comes from, so I'm not putting it. Zeus may have been prepared, but he underestimated his wife - Rhea didn't raise no fool, and Hera knew exactly what was up. 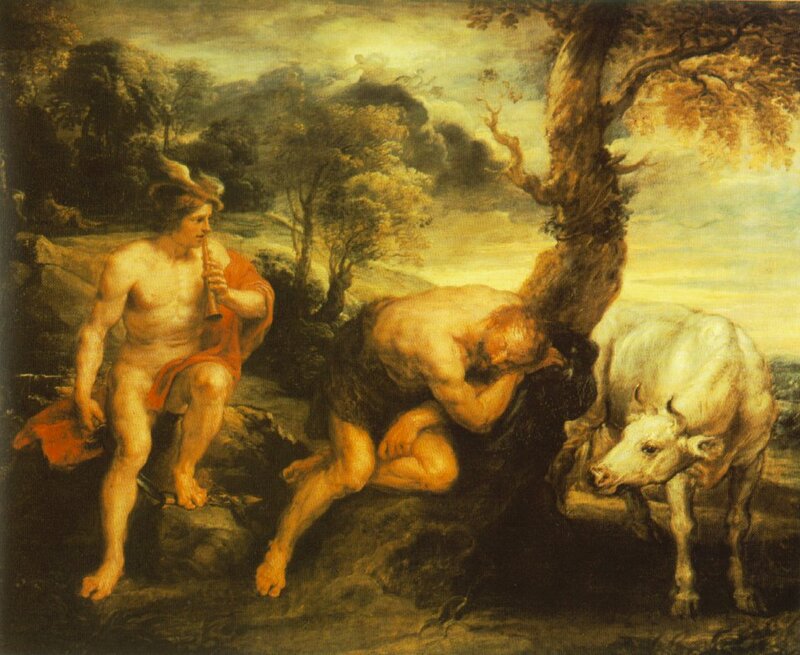 First she asked him if he had slept with Io, Zeus replied that he had not "known her" (which is why Hesiod says that the Gods are not angered by lovers who lie as they swear oaths). Sweetly, pretending she believed her wayward husband, she asked him if he would give her the sweet white heifer as a gift. What was he supposed to say? No? So little Io was given to her patron Goddess whose husband she'd slept with. Quite a predicament, huh? 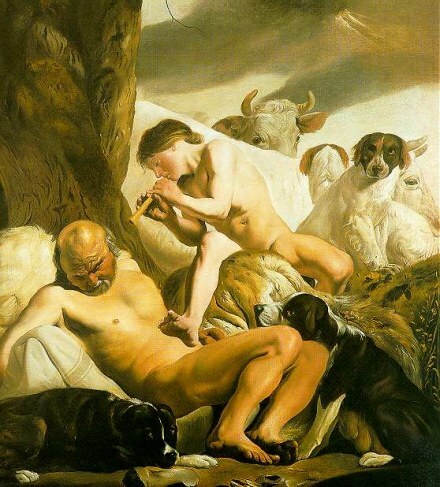 Not to mention the fact that as soon as Hera had the little cow, she set the hundred-eyed All-Seeing Argus to watch it. 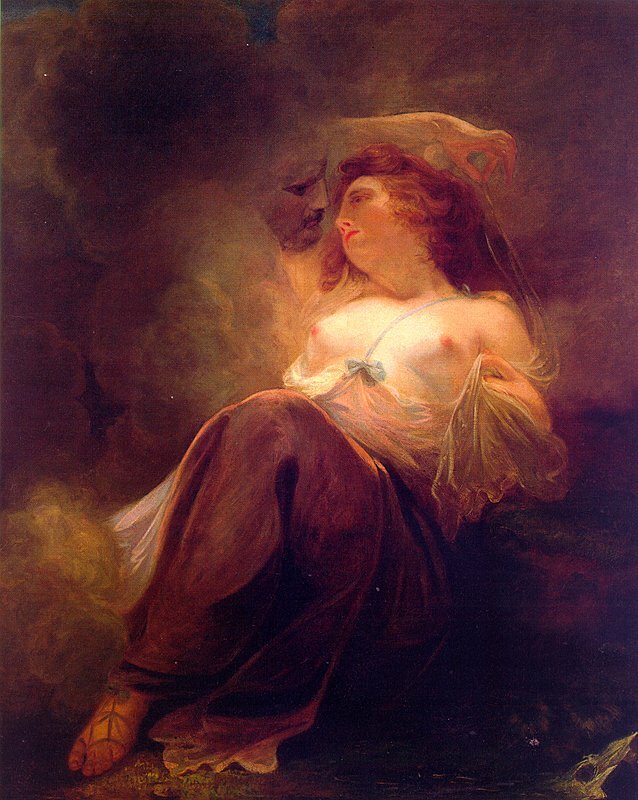 Knowing the Gods, there was no guarantee that Zeus would ever try to get Io out from Hera's clutches. But then one should remember that Dike and Themis sat at Zeus's sides - perhaps that was why Zeus didn't abandon her who knows? But anyway, Hermes was sent to rescue the fair priestess, now chained to an olive tree in Hera's backyard. I have frequently heard the story that Hermes went and told stories until Argus fell asleep, or rather, was bored to death (some versions just say that he put him to sleep and then killed him). And then there was this big ol' trial for the murder of Argos and Hermes eventually won because he was a good lawyer. However, Apollodorous says that Hermes couldn't come and steal Io away because this dude named Hierax sold him out. So instead, Hermes just threw a stone and killed Argus (and got the name Argeiphontes, which means Killer of Argus). By the way, if you want to check out Apollodorous' version, click here on the Perseus Project.